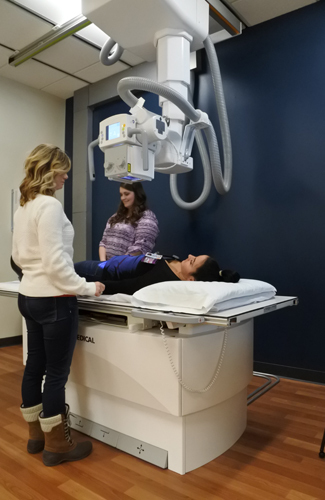 The Associate of Applied Science (AAS) degree in Radiologic Technology prepares students for a career in x-ray imaging as a Radiologic Technologist. The program is full-time, spanning 21 month/5 semesters, and is held at the Arvada campus, with clinical internships at area hospitals and clinics. The first two semesters of the program are spent in the classroom and lab, and the remaining 3 semesters are spent at various clinical sites. A capstone didactic course is required during the final semester prior to graduation. Due to the fast-paced and rigorous nature of the program, students are encouraged to have little to no outside employment responsibilities while enrolled. Please see Cost of Program for more information about financial resources available to students. Individuals interested in any of the Medical Imaging programs should consider attending one of the Medical Imaging Information Sessions. When enrolled in the clinical internship courses, students typically spend 30-32 hours per week at a healthcare facility. Students can expect to rotate through a variety of shifts on weekdays and weekends, during the day, at night, or overnight. Students provide their own transportation to clinical facilities, which may be located within a 150-mile radius from the college. For a list of current clinical sites, please see Clinical Affiliates. SCHEDULES ARE FOR REFERENCE ONLY AND SUBJECT TO CHANGE. Classes may take place during the day or evening. Some schedules are not posted as they vary greatly.